I do not post about games often, because I don’t play them much in last few years. Online games site Kongregate had been getting so many mentions on tech blogs that I ended up checking it out and even visiting quite a bit. 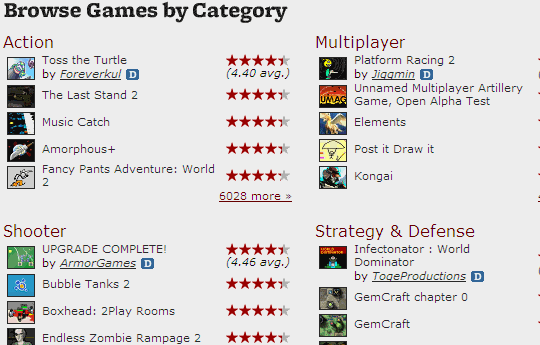 Site hosts large amount (over 25k at moment) of free flash games. Some games are simply mirrors from other resources and native sites, some are more tightly integrated and provide different badges tied to Kongregate account. On topic of account – there are plenty of social-like features that act like a hook to stay on site, earn rewards and levels. It can be completely ignored, but some people enjoy that kind of experience. Aside from collection there is also exclusive collectible multiplayer game called Kongai. there seem to be paid extras on site, but absolutely every game I played so far was free. Games run in the middle of the very cluttered page with multi-tab block to the right and extensive area with comments and other stuff to the bottom. It is distracting and I’d prefer cleaner design that makes it easier to focus on the game. With such amount of games their quality is highly variable. It is easy to stick with featured and top-ranked games at first. Beyond that it becomes harder to find games you will like, related games suggestions didn’t work too well for my taste. « Google Buzz – weird email or weird Twitter? Hey nice pick,I think I will definitely will check out kongregate! I usually play at Miniclip. Their web layout is also cool and (i think) pretty neat.